The Ferrari F40 - State-of-the-art race car built for the street. Despite being designed and introduced in the late 80s, there remain few supercars available now that outperform it. 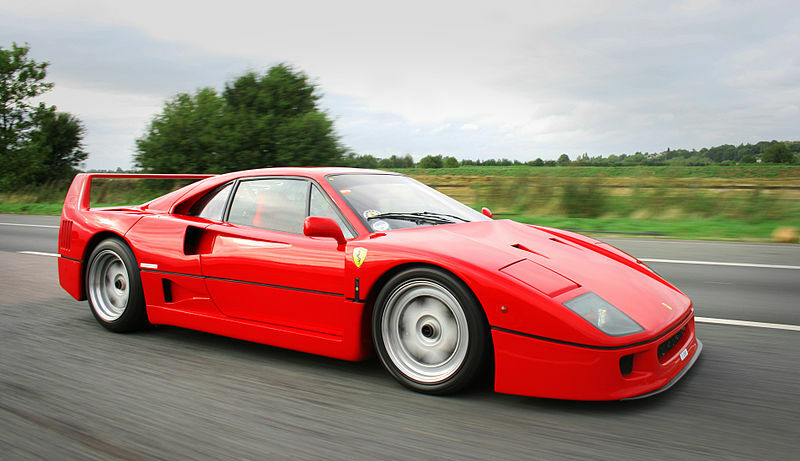 For sheer in-your-face raw power, it's hard to beat an F40. C'mon - the car doesn't even come with a radio. Or carpet. Or windows that roll down (ok, they added them after the prototypes were built). Ever since seeing my first F40 on the road, I've always been keenly interested in them, to the point that my wife has given me standing permission to purchase one should the possibility ever arise. Not being one who is content to wait, I figured I'd build a model of the dream. While the Tamiya 1/24th version is an excellent kit, I wanted something in a larger scale. The next obvious choice was the Monogram 1/12th kit. A word of warning: this kit (and all the kits in this series) is a dog. The body shape is wrong, the wheel sizes are wrong, and the the body/chassis/wheel configuration is absolutely horrible: unless you want to build a 4x4 Ferrari. Unfortunately, there really aren't any other mainstream kits available - Fujimi makes a 1/12th scale kit but it is difficult to find. Sooooo.... if you're really set on building a big-scale F40, you really only have one choice: the Pocher 1/8th scale kit. When I learned of the existence of this kit, I basically went on a crusade to obtain one: in fact it was one of my first eBay purchases (eBay in 1997 was a HUGE boon to modelers). I convinced the seller to overnight the kit to me, and it actually arrived on Christmas day. After studying numerous references and taking advantage of the ooopportunity to photograph a prototype, I realized the Pocher kit was deficient in some areas - for example, the entire fuel injection system is missing from the engine. So as I seem to be prone to do, I set about scratchbuilding some of the missing details. The entire project took about a year. When I was about 70% complete, I became aware of the existence of yet another must-have F40 item: the amazing Autograph (Germany) super-detailing kit. After poring over photos of the kit contents and corresponding with the owner of Autograph, I purchased a combination set including a (second) Pocher F40 plus the Autograph set. These toys arrived before I was finished with the first kit, so I boxed them up and put them in storage (after checking everything out, of course). I've included pages of the first Pocher F40 I built, photos of the contents of the Autograph kit, and some pictures of a prototype car I had the good fortune to examine first-hand. Pocher kits make excellent foundations for super-detailing projects. 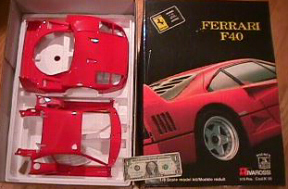 I have several of the kits, including two Ferrari F40s (and a Testarossa and several of the "classic" 2500+ piece Rolls Royces... but don't tell my wife!). The first F40 I built was actually a test case for the "ultimate F40" - a Pocher kit with Autograph (Uli Krug in Germany) super-detailing transkit.